Do you know that Major Maxwell Mahama (the soldier killed by mob attack) had the power and means to defend himself but chose not to just to preserve human lives? For me, it is beyond my limited human understanding. He had a gun on him but he didn’t use it on his attackers because he valued the dignity and sanctity of human life, no matter whose it was! What a sacrifice!! May his soul rest in perfect peace!!! Now, following the burial of our hero, Capt. now Major Maxwell Mahama earlier today, we must begin to learn the key lessons his sacrificial death was meant to teach us as a people. So then, “Never again” must not just become mere words that will vanish in few days. It’s time to know that we are all born to be each other’s keeper – to defender and protector each other. It’s time to know we are obligated to respect and ensure the realization of the dignity and worth of others for our own peace and security. The very first paragraph of the preamble of the Universal Declaration of Human Rights (UDHR) made this quite clear. It states, the “RECOGNITION of the inherent DIGNITY and of the equal and inalienable rights of all members of the human family is the foundation of freedom, justice and peace in the world”. All of us humans are “born free and equal in dignity and rights. We are endowed with reason and conscience and should act towards one another in a spirit of brotherhood” – so says article #1 of the UDHR. All the legal provisions on human rights, such as: right to life, no torture, no discrimination, no slavery, no unfair detainment, right to trial, always innocent till proven guilty and others, all exist to give true meaning to the dignity and worth of each member of the human family, be it young or old, black or white, rich or poor, weak or strong. Indeed one of the first human rights principles we teach young people in our human rights education programmes is the principle of Individual Responsibility in the defence and protection of the dignity and worth of every other person. We all have a duty to other people both individually and collectively. We have a duty to protect the rights and freedoms of other people wherever and whenever the need arises, and we should always do so. The good book, the Bible commands us to treat others as we would want to be treated. To do for others as we would want them to do for us (see Mathew 7:12). How can you look on while your fellow human being is being attacked without feeling the need to help in anyway? He who witnesses wrong doing and does nothing about it perhaps due to fear, is equally guilty of wrong doing. So my humble advice to you is: don’t engage in acts of mob justice and lawlessness. Don’t incite mob justice against anyone. Don’t take the law into your own hands – you never know where it will land you. And above all, don’t be unconcerned about the suffering and plights of others. Always try to do something no matter how small, to stop injustice and wrong doing wherever it is taking place if it’s in your power to do so. Let’s all decide to be there for each other and defend and protect the dignity and worth of human life wherever we find ourselves. The issue of banning citizens of some specific Muslim countries from entering the United States of America (USA) is very problematic indeed, not fit for purpose, and only going to be counter-productive in the long run – something we should all be concerned about. 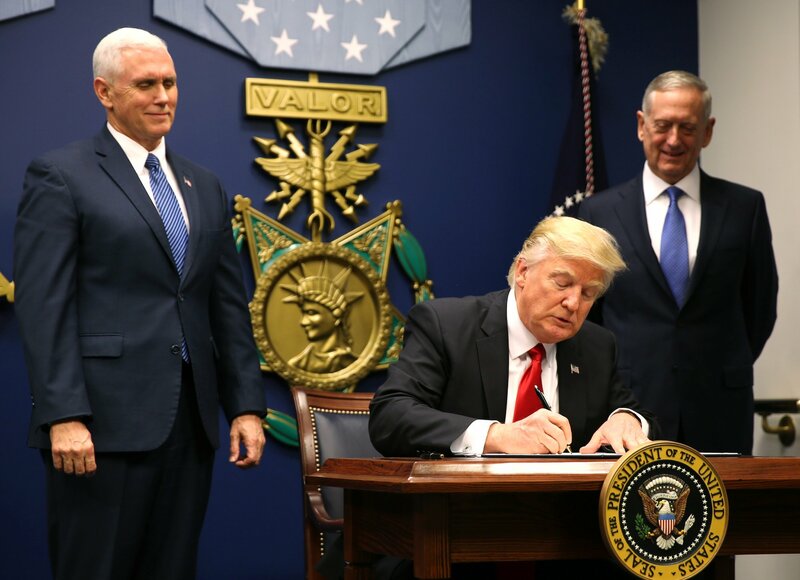 On Friday January 27, 2017, the new President of the United States of America, Donald Trump signed an executive order banning refugees and citizens of certain origin “roughly 218 million people from entering the United States”; mainly those coming from Syria, Libya, Sudan, Somalia, Iraq, Iran and Yemen – and still counting. 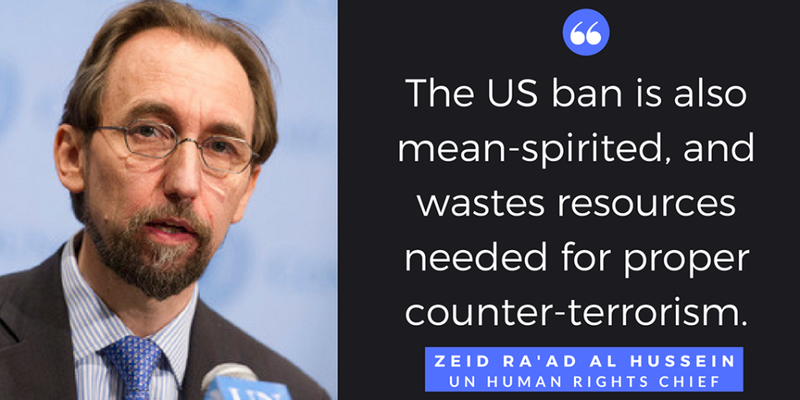 This extremely controversial Executive Order has rightly sparked nation-wide protests in the US, and received serious condemnation across the world including a statement by the UN Human Rights Chief – Zeid Ra ‘ad Al Hussein who said “Discrimination on nationality alone is forbidden under human rights law” and that “the US ban is also MEAN SPIRITED, and wastes resources needed for proper counter terrorism”, and I agree with him on both points! I personally consider it problematic because this is a human right issue which borders on discrimination based on origin and nationality – forbidden grounds for discrimination in human rights law. According to the Universal Declaration of Human Rights (UDHR) – Dec 10 1948, discrimination against any person based on his or her nationality is prohibited in article two of this all important human rights document. I strongly believe that this very article two which disallows discrimination is fundamental to the protection of the human rights of all persons; and is at the heart of creating a fairer and meaningful society for everyone. I also consider this ban very problematic because America is often at the forefront of promoting the culture of human rights in other countries, even to the extent of punishing those who don’t want to comply. How then can we reconcile this ban with their stand on human rights? I would like to remind Mr President Donald Trump that when it comes to the agenda of human rights promotion, he cannot pick and choose which rights to promote or not. We should rather look for better and workable solutions to global terrorism. This one is not fit for purpose. International Human Rights Day is commemorated every year on December 10 in honour of respect for human rights principle and values in society. 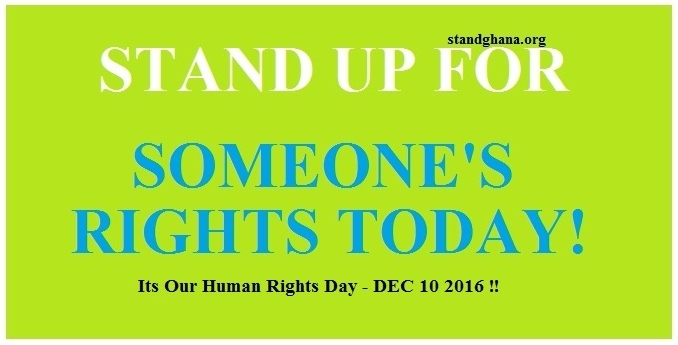 This year, the UN is calling on us – you and I, to: “stand up for someone’s rights”. The day is commemorated on December 10 every year because; the United Nations General Assembly adopted and proclaimed the Universal Declaration of Human Rights (UDHR) on December 10, 1948. And, since 1950, ‘December 10’ has been set aside as international human rights day. The day reminds us of our responsibility to promote, protect and respect human rights of everyone, and to engender faith in all human rights principles. Article one of the UDHR document states that: “All human beings are born free and equal in dignity and rights.” But, do all human beings in our world today truly ‘FEEL’ free and equal in dignity and in rights? Indeed, although the UDHR states everyone has human rights, there are many who feel what is written down in the UDHR document is not reflected in their day-to-day lives. There are still too many in the world who don’t know their human rights and there are many who can’t enjoy their rights even if they do know them. Human Rights Education is a RIGHT! 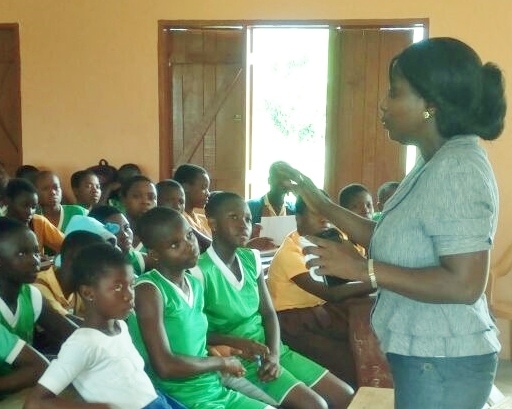 The Kpone Katamanso District JHS 1-3 students learnt about their human rights and responsibilities, including self-esteem coaching for the girls, at the school’s premises recently. By this, the provision of Human rights education in schools is rightfully being put on the agenda in Ghana by Stand Ghana through schools outreaches programme. We need an empowered society. This is because those who know their rights are better placed to defend themselves and live meaningful lives than those who don’t. We believe that young people who know their rights and responsibilities are better empowered for the future. 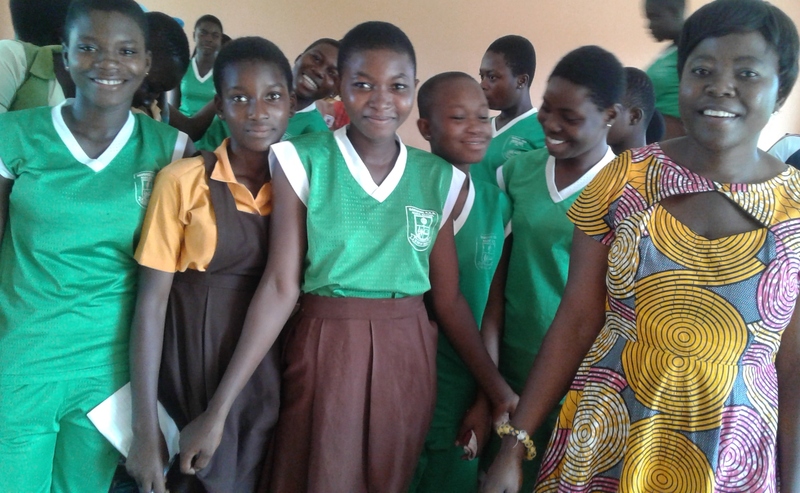 That’s why Stand Ghana continues to educate many more students, particularly girls about their human rights. If Knowledge is power, awareness of the full range of one’s human rights is greater power indeed! With obligation to achieve gender equality in compliance to International human rights conventions and protocols, government of Ghana needs to increase awareness on human rights and step up on women & girls empowerment as a matter of priority. So what is the problem? The main problem from my point of view is lack of awareness and implementation challenges. A Human right on paper is useless unless it is made real in the lives of those who need it. So, government needs to take its responsibility to promote, protect and fulfil human rights in Ghana more seriously. Parental poverty seems to be the main impediment to children’s Right to free Primary Education in Ghana, as many children still do not attend school due to lack of basic necessities and learning materials. 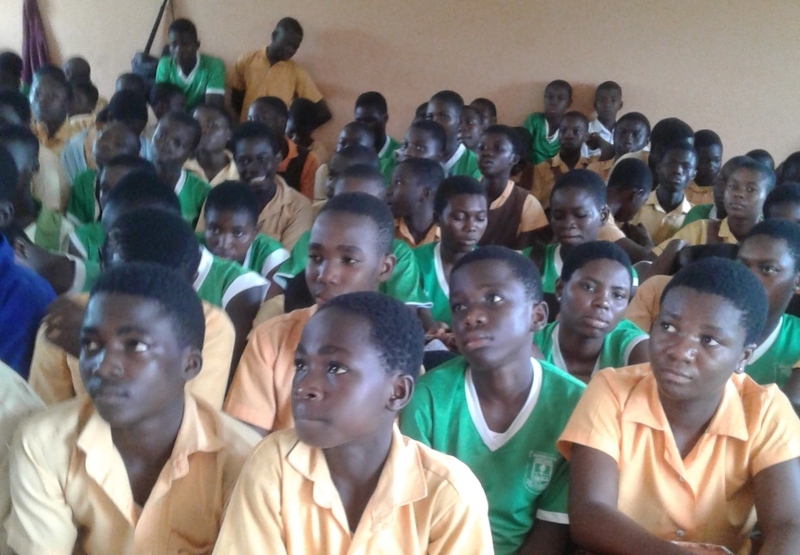 The Stand Ghana team has been informed that even some of the children in school are there at a heavy price since a number of them are compelled to engage in negative practices such as sleeping with men for money in order to be in school. Article 26 of the Universal Declaration of Human Rights (UDHR) states that primary education should be made free; similarly, the Convention on the Rights of the Child which was adopted in 1989 by the UN General Assembly and came into force on 2nd September 1990, also affirms that primary education must be made available free to all. The reality however is that although each child supposedly has the right to free primary education in Ghana, many children, especially those from very poor families are still not able to enjoy this right even when they are not expected to pay fees. The reason Art 28 (1a) of the Child Right Convention requires states parties to make primary education compulsory and available free to all, is to ensure children of school going age are really in school for proper formation and development of their personalities. Yet this objective is sadly far from reality in many communities. Ghana was one of the first to sign the Convention on the Rights of the Child (Ghana ratified this convention on 5th February, 1990). As a result, primary pupils in public schools do not pay tuition fees. Even though this is laudable, the fact remains that many children still do not attend school due to lack of financial support. Our interactions with some parents and teachers indicate that the real cost of getting a child through primary school is not payment of tuition fees, but the numerous expenses parents make to get the child ready for school. For example, aside tuition fees, parents have to provide school uniforms, note books, exercise books, pens, other learning materials, as well as PTA dues just to name a few. In addition, parents also have the responsibility to ensure their children’s basic needs such as prescribed shoes. socks and underwear for example, are provided regularly. This is a huge responsibility for many urban poor and rural farmers in Ghana today. Many parents and guardians said they are unable to bear the cost of educational materials and what it takes to get their children to school daily due to financial constraints. This is particularly true of rural communities where most parents and guardians depend on extremely scanty incomes from subsistence farming. 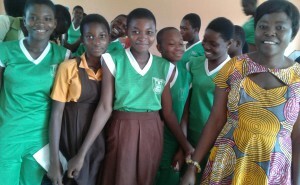 We are reliably informed that to be in school, some JHS girls are forced to sleep with men for money to buy pads for their menses – otherwise they will have to stay at home. This issue came to light again at one of our human rights educational events on child rights and responsibilities. The PTA chairman lamented about the fact that some of the JHS girls were no longer spending the night with their parents but with men and were going to school straight from the men’s homes instead of their parents’; and this is affecting their performance in class. When asked during our interaction with them whether the PTA chairman’s allegations were true, the children said yes. We are alarmed and deeply worried about this development considering the possible negative impacts on these girls – such as the risk of sexual violence, getting sexually transmitted diseases and teenage pregnancies which could eventually lead to their dropping out of school and destroying their future. We have to remember that by preventing children from going to school due to poverty, we are preventing them from having a better future and being useful to society. There‘s no doubt that poverty is a major challenge to a child’s right to education; and unless the issue is properly tackled, the right to free primary education will remain a mirage for many children. We call on government and other stakeholders to step-up more on the agenda of poverty alleviation. We urgently need to tackle severe poverty in Ghana head-on and genuinely. Only then can we truly talk about the right to free primary education for all Ghanaian children. In Ghana, all Your basic Human Rights and Freedoms are protected under the 1992 Republican constitution. All the human rights provisions are found in chapter five of the constitution. These provisions give effect and meaning to the rights and freedoms set out in the Universal Declaration of Human Rights established by the United Nations in 1948; to which Ghana is a signatory. So, if you are Ghanaian or reside in Ghana, your human rights are duly guaranteed by the constitution, and can stand on any of these provisions to seek redress if you think your rights have been violated or is about to be violated. In this section we provide some key information on your right to life as stated in article 13 of Ghana’s constitution. What Are Your Rights Under this Article? d) in order to prevent the commission of a crime by that person. Your right to life also means public officials and institutions such as the police must sometimes take positive steps to protect you if it is believed that your life is in danger at any particular point in time; otherwise they (the Police) may be violating your right and in breach of article 13. In addition, if someone is killed by a public official or someone dies because a public officer failed to protect their life, when they should have done so, the state is obligated to investigate the matter. WHEN TO SEEK REDRESS ? • Failure or Refusal to investigate a death caused by a public official. The unequal status of women and girls in the Ghanaian society is still a major hindrance to community development and progress. Do you know that many women continue to be attacked verbally or physically for voicing their opinion on community and other societal issues? It’s still generally believed in Ghana and other parts of Africa that women have no right to challenge authority. If you do the consequences can be dire for you and your family. A vocal woman who just wants the good of his community is often tagged as behaving like a man, ‘too known’ or simply difficult and unbearable. Thus, even if a woman feels strongly that certain things are not going well in her community she is unable to voice it out openly because the powers that be will not take it kindly. Women therefore remain marginalised and excluded from key decision making groups, bodies and institutions; a situation which is slowing down the pace of development in most parts of the country. Last week a certain gentleman complained to me that a lady in his neighbourhood (at New Mamprobi in Accra) is the cause of their plight – she is the reason why their road remains bad and without gutters. Her charge was that she confronted their Member of Parliament over lack of development in the area, and because of her actions the MP made sure the area (the particular street on which she resides) is excluded from current community road improvement and gutter construction projects. He lamented: “ the woman is not good at all, she thinks she is a man, in fact she is too difficult”. I believe all that this woman wanted was the good of her community. But members of the community now see her as their enemy. They are actually upset with her – which is worrying. Although article one of the Universal Declaration of Human Rights states that: “All human beings are born free and equal in dignity and rights…” this is hardly the case for most women today. Community development ought to be a shared responsibility between men and women. We must understand that women’s voice only adds to the development of the area – it does not subtract from it. The general perception that women’s opinion do not matter must change for Ghana to move forward faster. There has been considerable debate lately about freedom of speech and expression nationally, following a number of contempt charges against some journalists and other members of society by Parliament and the Supreme court of Ghana. We at stand Ghana deem it necessary to explain some of the misunderstandings about this very important fundamental human right. Claiming our rights responsibly is a fundamental duty as responsible citizens of Ghana or any other society for that matter. However, within that right is a responsibility – that is , the duty to respect the rights of others and the laws of the land. Without that responsibility, even our own rights become meaningless. For example, no one can stand on the human right to freedom of speech to limit or undermine the human rights of others, incite violence or hatred towards others. In law and in practice, freedom of expression is limited and in particular does not protect any statements that seek to discriminate against or harass others, or incite violence or hatred against other individuals and groups, particularly by reference to their religious/political belief, gender, race, tribe, ethnicity, age or status. We cannot over emphasize the important role of freedom of expression in a democratic society such as ours. But, we are obligated, and for good reason, to claim our rights responsibly, bearing in mind the rights of others and the over all public interest, so that we as a people can experience true peace, democracy and meaningful development in our dear country.